There's a little matter to be settled on some lakefront property in Wisconsin today. And everyone is talking about the "young guns," the 20-something band on the front page of the leaderboard. 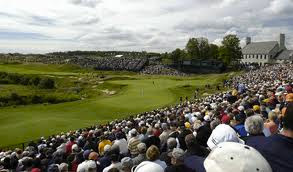 But to look forward, you first have to look back to the last PGA Championship at Whistling Straits. In 2004, everyone was hailing this unique setting, which presented the challenges of a US Open with the look of a British Open. It was going to be brutal - except Vijay Singh was -12 through 3 rounds. But on Sunday, everything got tightened up. Singh shot 76 with no birdies until winning in the playoff. I look for history to repeat itself and 29-year old Nick Watney's -13 and 3-shot lead to go by the boards long before the end of the day. That leaves a very precocious group to seize the trophy. Exhibit A: Rory McIlroy (21). While Tiger Woods' grip on the #1 World Golf Ranking will be over fairly soon, who immediately succeeds him (Phil Mickelson, Lee Westwood) is a mere formality. McIlroy is the next world's-best-golfer. He owns the year's most dominant performance with a 66-62 finish in Charlotte, blasting past Phil Mickelson in the process. McIlroy also pounded St. Andrews with an opening round 63 at the British, before he got hammered by the weather in Round 2. 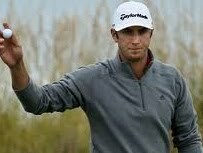 Exhibit B: Dustin Johnson (26). The 6-foot-4 South Carolinian makes you take notice. He's got "extra" length off the tee, and can routinely out-drive Tiger. He can dunk a basketball. And just watch him swing and watch him walk - everything exudes confidence, except his face. He's a "flat-liner," and maybe with the Sunday US Open blowup in his rearview, he may become the next face of American golf. 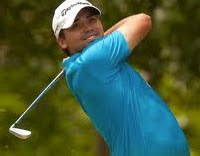 Exhibit C: Jason Day (22). This is the wild-card. He's been flying under the radar until taking The Byron Nelson this year in Dallas. While McIlroy blows you away with his moxy and Johnson with his talent, Day has all the tricks in a short game reminiscent of someone twice his age. While these men may represent the next Big Three in professional golf, you never know what the future holds in such a tenuous profession (see: Garcia, Sergio). And we don't want to write Tiger off too soon, though he won't win this tournament. He could find his way from 31st place to a Top 10 finish. That would give him three Top 10 Majors in a tumultuous, transition year in his life, a season 98% of PGA Tour golfers would probably trade their career for. 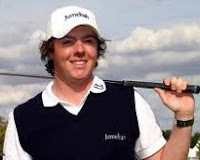 And the winner today will be: Rory McIlroy. His first of many career Golf Major championships.